Sri Lanka 294 and 7-225 (Dimuth Karunaratne 85, Mahela Jayawardene 60, Mitchell Johnson 2-19) leads Australia 9-432 declared (Matthew Wade 102*, Phillip Hughes 87, David Warner 85, Rangana Herath 4-95) by 87 runs. Sri Lanka scored 294 runs in their first innings and managed 225 after losing seven top order wickets in the second. 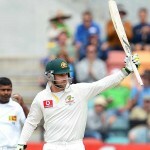 Australia responded nicely by smashing 432 runs with one wicket still in hand when Michael Clarke declared the first innings. 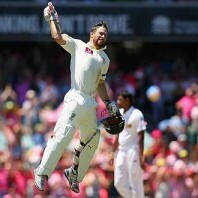 The stumps were taken on day three, Saturday, January 5, 2013, at Sydney Cricket Ground. Earlier, the Kangaroos started the day at 6-342 in 88 overs, Matthew Wade was at the crease with 47 accompanied by Peter Siddle who was at the other end on 16. Wade completed his fifty in the second over of the day as Siddle hit a couple of fours in the early overs. The latter survived a review but was caught behind by Dinesh Chandimal off Nuwan Pradeep for 38 as the score reached 384. The visitors came back to the game by removing Mitchell Starc and Nathan Lyon cheaply with the addition of nine runs to the total. The last batsman Jackson Bird joined in with Wade who was batting at 70 runs at that moment. 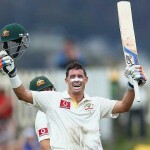 The latter took over and added nine runs in the 103rd over with 2 fours and was rushing towards his hundred. 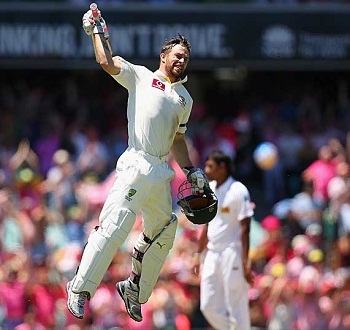 Matthew Wade thrashed his second Test ton in the 107th over with 2 fours as the Australian skipper, Michael Clarke, declared the first innings at 432 for the loss of nine wickets. Rangana Herath was the most successful bowler with four, Nuwan Praddep held two and Tillakaratne Dilshan claimed one wicket. Sri Lanka went into bat in their second innings with a deficit of 138 runs and Dimuth Karunaratne took a brisk start by sending the ball out of the fence twice in the first over. Tillkaratne Dilshan opened his account with a single on the 15th ball he faced but was caught by Phillip Hughes in the third slip off Mitchell Johnson for 5 off 21 balls. The first wicket fell at 24 as the Lankan Lions’ captain, Mahela Jayawardene, walked in the centre and tried to consolidate along with Karunaratne by avoiding taking any risk initially. The boundaries started flowing from the woods of the two batsmen as Karunaratne added another 2 fours in the 17th over and Jayawardene kept on adding runs from the other end. Dimuth Karunartane achieved his second Test fifty with a six over long-on three overs later and got a lucky escape when he was dropped by Matthew Wade off Nathan Lyon at 54. The first hundred of the innings was displayed on screen in the 24th over as the partnership kept on flourishing. The score was enhanced to 132 when Karunaratne was caught behind by the wicket keeper Wade off Jackson Bird for 85 off 109 deliveries with 1 six and 10 fours. Mahela Jayawardene attained his 45th Test half century with 2 fours in the 38th over as the middle order batting of the tourists crumbled again. The Islanders lost two quick wickets of Lahiru Thirimanne and Thilan Samaraweera as the score touched 158 in 41.5 overs. Jayawardene kept his cool as Angelo Mathews looked in great nick and he got 3 fours in the 46th over. There was a bit of misunderstanding between the two batsmen while going for a run which resulted in the run out of Mathews for 16. The fifth wicket fell at 178 and the Islanders faced another blow when Mahela Jayawardene was gone at the same score after contributing 60 runs from 128 deliveries with 9 fours. Dinesh Chandimal and Dhammika Prasad enhanced the score to 202 before the latter lost his wicket for 15. The visitors scored 225 runs with three wickets in hand in 62 overs at the close of the third day’s play. Dinesh Chandimal was batting at 22 and was trying to stop the invasion of the rival bowlers as Rangana Herath was at the other end for seven runs. Mitchell Johnson secured two wickets whereas Mitchell Starc, Jackson Bird, Peter Siddle and Nathan Lyon shared one wicket each. Australia looks in total command of the match and will try to remove the remaining three wickets without the addition of a substantial score. Another 75-100 runs to the total by the Sri Lankan batsmen can make the game interesting.